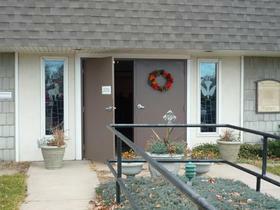 This statue of Saint Francis of Assisi sits out front of our church welcoming all visitors. had him renamed Francesco (Francis in english). 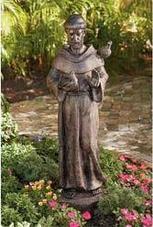 Saint Francis founded the Order of Friars Minor (The Franciscans). about him than any other saint. animals and a straw-filled manger (a feeding trough) set between a real ox and a real donkey. Cross of San Damiano, he heard the call of God to "rebuild my church". 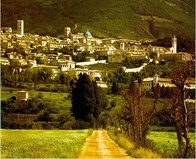 the Church of San Damiano as well as several others in the region. Soon he had followers, one of which was St. Clare of Assisi. Painted by a Benedictine Monk approximately 1218. The earliest known painting of Saint Francis. 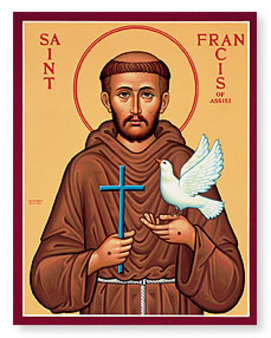 Saint Francis if considered by many to be the first Italian poet. His writings are still considered to have great literary value as well as religious value. The Prayer of St. Francis is considered to be one of his most famous prayers although it doesn't appear in any of his writings. The first known appearance of this prayer was in 1912 in a French magazine called, "La Clochette". During WW1 & 2, small cards were passed out to soliders with a picture of Saint Francis on one side and the prayer, known then as the Peace Prayer of Saint Francis, on the other side. His feast day is celebrated on October 4. Many churches will hold a 'Blessing of the Animals' on or around this day to commerate Saint Francis and his love for the animals and the environment. Prone to illness most of his life, and suffering from the Stigmata, he died on the evening of October 3, 1226 singing Psalm 141. On July 16, 1228, he was pronounced a saint by Pope Gregory IX. 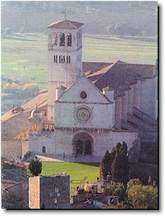 It was Pope Gregory IX who laid the foundation stone for the Basilica of Saint Francis. 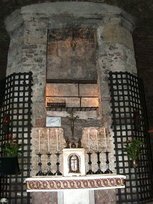 Saint Francis was buried on May 25, 1230 under the Lower Basilica. 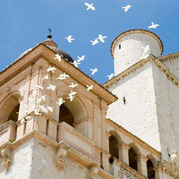 According to legend, the doves at the Basilica arrived as soon as the foundation stone was laid and have roosted there since.